A conblock will be installed on the sidewalk of Lake Sunter Police Station, Tanjung Priok ina a bid to beautify the area around the Asian Games homestead athletes.
" 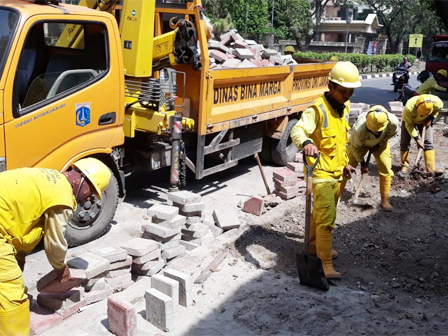 Up to now, it has been installed around 200 square meters"
Ujang Royani, Division Head of Road and Bridge for North Jakarta Bina Marga Sub-dept. said the project has been ongoing since June 20. "Up to now, it has been installed around 200 square meters. And the rest are still being conducted," he stated, Tuesday (7/3). Every day, 15 taxforces of North Jakarta Bina Marga Sub-dept. are sent to conduct the project that aims to be complete prior to Asian Games. "It is targeted to be completed on July 22," he said.